My very first Bridal Show was this last January at the Bridal Spectacular Bridal Show. I was excited because not only was I going there as a visitor but I was going to help my friend Norina of Maple Hill Photography with her booth the following day. Since this was my first one I have a few tips to share for your first Bridal Show. When going to a bridal show buy tickets to attend for what ever days they are showing. For the January show I would have bought two tickets to attend both Friday and Saturday. The reason I suggest this is because there are TONS of fabulous vendors at the show. On day one plan on going and seeing all the vendors. You are going to get lots and lots of business cards and information. Since I’m very visual when you find a vendor you like grab your phone and take a picture of their booth. This way when you are looking at all the information that night you will be able to remember who you fell in love with. Now on day two go back and visit those vendors that you fell in love with. Going the second day to just those vendors will make it easier to ask questions you may have thought of after you left the show the previous night. At the January show there was food and beverages available but they were CASH ONLY. At this show 24 oz draft was $7.00, 16 oz bottle beer $6.00, mixed drinks $6.00, wine $6.00 and sodas $3.00. I didn’t check out the food cart but plan on bring some cash incase you get hungry or thirsty. Make sure to enter to win $1,000 towards a Couture Bride bridal gown at Veils, Tails and Cocktails! I love Couture Bride they are the number one Bridal gown boutique in Las Vegas! The above photographs are all SOOC (Straight Out Of Camera) from the January Bridal Spectacular show! Bridal Spectacular is doing it again!! 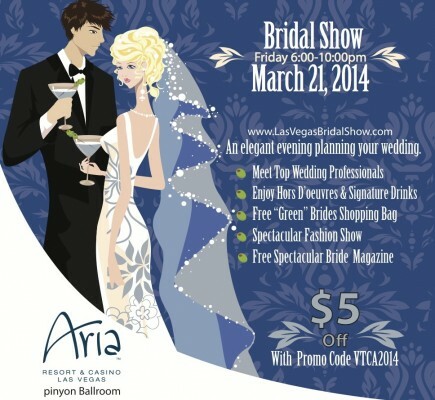 Bridal Spectacular’s next Bridal Show is Veils, Tails and Cocktails at The Aria!! A boutique wedding planning experience for the bride who wants only the best for her wedding. Get inspired, see cutting edge wedding trends, meet your vendors, see a fashion show! Bridal Spectacular Events, the best in bridal shows since 1991! Tickets $20.00 Purchase tickets here!